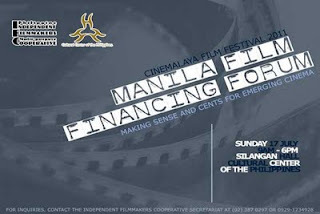 The Philippine Independent Filmmakers Multi-purpose Cooperative (IFC) in partnership with the2011 Cinemalaya Philippine Independent Film Festival is conducting the 2011 Manila Film Financing Forum, "Making Sense and Cents of Emerging Cinema"on July 17, 2011 (9am-6pm) at the Silangan Hall of the Cultural Center of the Philippines. The forum will have an in-depth discussion of the ABC’s of film financing, case studies and a project market where selected participants pitch their projects in a speed-dating style to potential partners and investors. Among the speakers are pioneers in independent digital filmmaking: Raymond Lee, Adolfo Alix Jr., Manet Dayrit and Doy del Mundo. Singapore-based Mel Songco of the Innovation and Creative Enterprise (ICE) Group will discuss the growth of creative economy in Asia and Indonesian producer Shanty Harmayn-Hofman of Salto Films will talk about structuring film projects for investors. Twenty outstanding projects are going to be selected and pitched to financiers that are in need of financing and assistance in various stages -- development, production or post-production. The most outstanding project pitch will win an automatic selection to the Asia On The Edge (AOTE) PITCH IT! in Cebu City this year. For inquiries, kindly contact the IFC Secretariat at (632) 3870297, mobile +639291234928 or send an email to indiefilmcoop@gmail.com. Entry forms are available with the IFC Secretariat, CCP and Cinemalaya. Click to download registration form here.